All compositions submitted to the Grawemeyer Award for Music Composition competition become the property of the University of Louisville Dwight Anderson Memorial Music Library and are deposited in an archival collection housed in a secure area. The collection includes scores, recordings, and documentation for over 5,000 entries, many of which are unpublished and unavailable elsewhere. All submissions are searchable in the library catalog and are also available via PDF lists under the "Entry Lists by Year" tab above. All material contained in this collection can be accessed by students, faculty, and visiting researchers. To request access to materials contained in the collection, please click on the "Request Grawemeyer Collection Materials Here" button on the right. 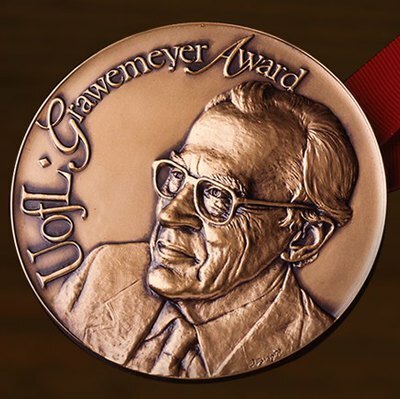 Scores, sound recordings, and accompanying documentation (information files) associated with the Grawemeyer Collection can be requested by anyone for in-library use only. University of Louisville School of Music faculty may request these materials for 30-day circulation outside the library. Since the collection is stored outside of the library, it can sometimes take up to 2 business days to retrieve items, but most requests are generally available on the same day. You will be notified via email when the items are available for you to use. Requests received on weekends will be processed on Monday morning. For questions regarding access to the collection, please contact library director James Procell at james.procell@louisville.edu or (502) 852-0528. Because a large number of scores in this collection are unique, rare, rental-only, or unavailable elsewhere, we consider loan requests to other libraries via interlibrary loan on a case-by-case basis. The decision to loan scores from the Grawemeyer Collection to other institutions is made only by the library director. For questions concerning the loan of Grawemeyer Collection materials via ILL, please contact library director James Procell directly at james.procell@louisville.edu or (502) 852-0528.